Hello! I made this yesterday for Sketch Challenge#343 on Splitcoaststampers. I needed a card for a friend who recently lost somebody special to her. Hopefully this will cheer her up a little bit:) The butterfly is from the PTI set Butterfly Dreams, and I used the coordinating PTI Butterfly die. The dp is Fancy Pants Designs Beach Babe, and the sentiment comes from the PTI set Through the Trees. Well, I found out yesterday that I'm going to have to have Thyroid surgery:( A few months ago I developed a very large nodule on the right side of my thyroid. I finally had it biopsied last Friday, and although it's not lymphoma (yay!) they said it's still concerning and they recommend having the right side of my thyroid removed. I'm a little nervous because I've never had surgery before, plus I'm not looking forward to the beautiful scar on my neck. This bulge I have isn't looking very hot either though. If anybody has any tips or has been through this, I'd love to hear from you! That's it for me today. I'm off to take my youngest to the doctor for a shot (fun) and my daughter to the dentist. Have a wonderful Thursday and thank you so much for stopping by! I am so sorry to hear about your thyroid and your future surgery!! I am praying for you. I had a c-section with my youngest daughter but that is the only surgery I have had. I have been blessed. Your card is gorgeous!! I just love your butterfly, colors and the take on the sketch! Beautiful stitching!! Kerri your card is beautiful, I'm sure it will help lift your friends spirits. Sorry to hear about your surgery, you know I will be thinking of you. I have had 2 surgeries when I was fighting breast cancer, it really isn't that bad, but I understand how nerve racking it can be. I'm sure you will be in wonderful hands and everything will go smoothly. If you need anything just let me know. Hugs to you, Kerri, as I know it can be an anxious time! Never had anything related to the thyroid, but had 2 minor surgeries in the past. Having a reputable surgeon always put me at ease. Scarves are such a fashion item theses days and they can be your "friend" for awhile. :-) I love your card, btw! I haven't gotten to use this sketch, but want to try it out as it's so different! Ooooo, sending a huge hug your way!!! Lovely card - that LO is great and you chose beautiful paper. 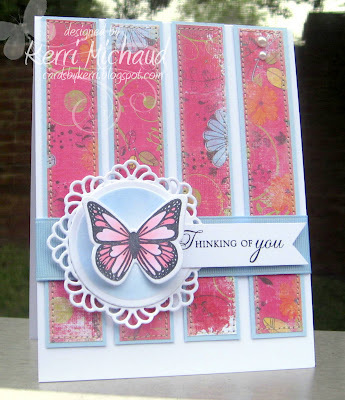 Kerri, WOOOWEEE this is sooo beautiful, LOVE your colors and this design rocks!! Hope you have a wonderful weekend sweetie! Sending you hugs and prayers your way Kerri! Loving the gorgeous card! Oh gosh, Kerri, sorry to hear you need surgery and I'm super happy it's not lymphoma. I'll be thinking of you! Your card is a knock out!